Masha and the Bear, Holiday on Ice is a new festive DVD with lots of wintery fun. It has been a while since Lara and Holly had watched any Masha and Bear and gosh, they were so excited to watch this new DVD. Masha and her friend Bear hold so much fascination because of Masha's cheeky tricks and the intriguing, almost-silent slapstick comedy throughout. If you've never seen Masha and the Bear before, let me explain...Masha is a little girl who randomly appeared in the wood and made the gentle Bear (a retired circus act) her friend. Masha is a little bit like Holly...very demanding and with absolutely no fear! Bear does his best to look after her even when she gets up to some naughty tricks and overly-adventurous antics. In this new seasonal wintery DVD you'll find lots of wintery and festive episodes. and The Wolf and the Fox. We enjoyed the title episode most - in Holiday on Ice Masha is determined to master ice skating. Having literally just got in through the door from trying to teach Holly how to roller-skate, I can tell you that Holly and Masha really are like two peas in a pod! Bear and his lady friend do their very best to try and keep Masha out of trouble down on the frozen lake and she picks it up in the end. The new DVD features lots of snow (the girls enjoyed the episode which features creepy snow tracks from forest animals). Holly is starting to get into a Christmassy mood now so she also enjoyed the Christmas Tree episode in which bear gets really excited about Christmas but Masha seems to wreak havoc and the tree burns down! The end of the episode is lovely though; Masha and Bear put everything right and there is even a visit from Father Christmas. This episode is packed full of laugh-out-loud slapstick moments that the girls loved. 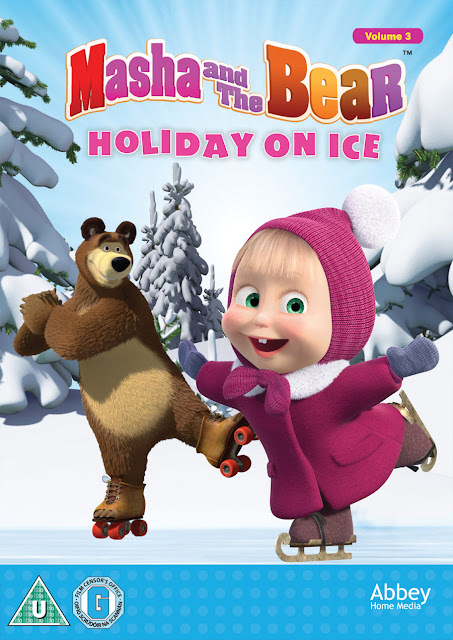 If you have a Masha and Bear fan then I'd highly recommend this as a festive DVD. To be in with a chance of winning a copy of Masha and the Bear - Holiday on Ice, all you have to do is to leave me a comment below to tell me your favourite winter activity. The competition closes on the 10th December. 5. Closing date for entry is 10th December 2016. After this date the no further entries to the competition will be permitted.